Looking for effective DA: Inquisition warrior builds? You’ve come to the right place. All of these builds have been tested & played extensively on Nightmare difficulty and come with explanations on how to use the build, and which points to take as you level up. I’m always adding more builds, and if you have your own ideas, be sure to let me know through the comments on the front page or the contact form. Note: If you don’t have the Trespasser DLC’s skill upgrade toggles, just take the skill upgrades that are available. This is a standard, all-around safe Two-Handed early game (level 1-12) warrior build for Nightmare difficulty. 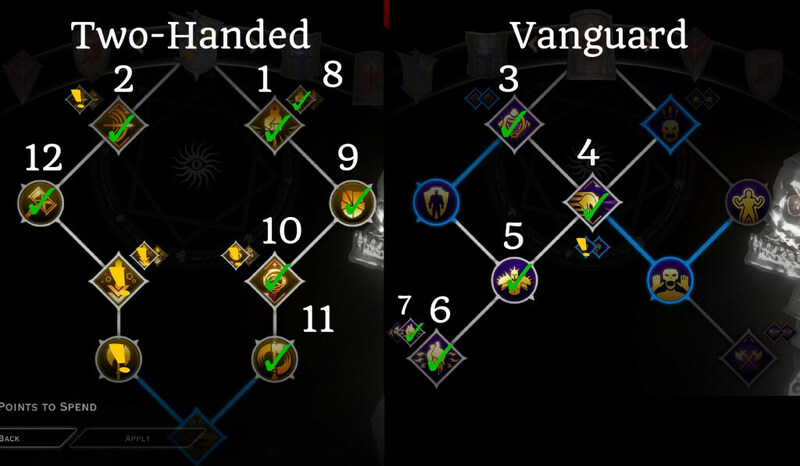 Although it may seem strange to pick up so many skills in Vanguard (a defensive tree), it is very important to have guard-generating abilities, as this will greatly improve your survivability before you have access to guard-on-hit masterworks and Tier 2/3 crafted gear. After this build, you can safely transition into the Two-handed Reaver, Champion, or Templar build, and respec later on to slightly adjust your skill point placement. Keep in mind, this build is not designed to act as a main tank for your party. However, you will be able to off-tank, and take a decent amount of damage without dying and chugging potions. 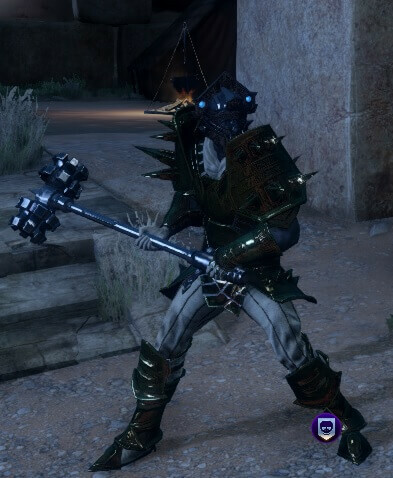 This is a basic tanking build that can be employed during the early portions of the game (levels 1-11, before you unlock Skyhold and your specialization). Afterwards, you can transition into any warrior specialization and continue playing as a tank/support, although the Champion spec would work best for pure tanking. Note that Charging Bull is an optional skill for this build. Although it is a great all-around skill, it’s not required for tanking, so it’s up to you if you want to get it. Personally, I would only take it if I’m going to be manually controlling the tank a lot. This build is designed for one thing, and one thing only – tanking on Nightmare difficulty. We are not going to take ANY skills from the Sword and Shield tree, because none of them really help us tank. Instead, we are going to almost completely max out the Vanguard and Champion trees, to create the beefiest tank possible who will never ever die or lose aggro. This build is slightly stronger than before with recent changes to the Line in the Sand and Livid skills, as well as the new Trespasser skill toggles. Although I’m still not a fan of Line in the Sand, you have room for it on your skills bar so you can try it out and see if you like it or not. Note: for the Walking Fortress and Line in the Sand skills, both the old and new skill upgrades are good, so you can use whichever one you prefer. This is probably the highest damage build available to warriors. It has changed a bit with the release of the Trespasser skill toggles, but is still viable without the DLC. The build is relatively easy to play, but does have gear requirements that other classes and specializations don’t have to worry about. One thing to mention is that once you have access to all the reaver skills, the skills from the two-handed tree are no longer needed, since all of your damage will come from your reaver abilities. However, you should still have Pommel Strike and Block & Slash on your bar, because these two skills do have some situational uses. For example, Pommel Strike can be used to interrupt a dangerous spellcaster, while Block & Slash is great against shield-users, as they will often block your attacks and knock you down. Use Combat Roll (Coming Through upgrade) , especially when enemies are grouped together – it deals a lot of damage! guard-on-hit masterworks are necessary for Reaver warriors. Craft a weapon/armor with fade-touched Silverite for +5 guard on hit; if that’s not enough, you can add on a secondary guard-on-hit masterwork with +3 guard, as these will stack together. This unconventional build is one of the most effective ways to solo the game without a party. As many other skill builds, the 2H Champion relies on one central skill interaction. That interaction is Walking Fortress, Flow of Battle, and Whirlwind. The basic way this build works is this: Flow of Battle reduces the cooldown of all your skills by 1 second whenever you score a critical hit. So when you pair it up with Whirlwind (skill with the highest number of hits available to a warrior) and high critical strike chance, you can reduce your cooldown times so quickly that you can use Walking Fortress with very little downtime. Since Walking Fortress gives you complete damage invulnerability for 8 seconds, you can imagine how strong this skill combination is, especially for soloing the game. The other skills you get are just icing on top of the cake. Early on (level 1-11) this build plays like a standard two-handed warrior, so you can choose to grab the 2 optional skills in the Two-Handed tree: Pommel Strike and Guard-Smasher. 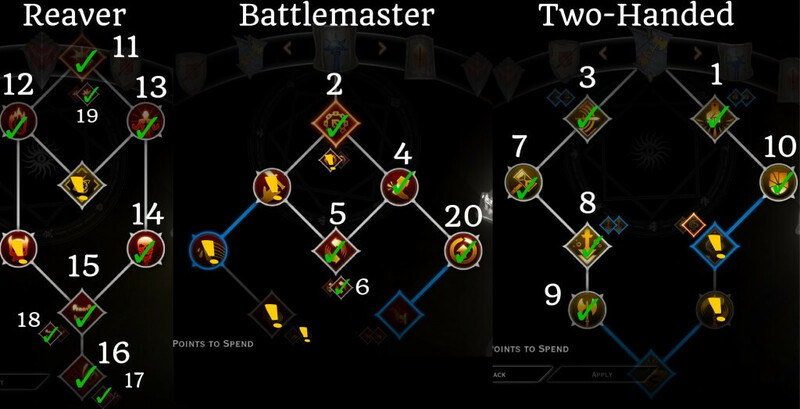 As soon as you unlock the Champion specialization you can respec and drop these, so you can reach your most important skills faster. If you’re having survivability issues at early levels, consider picking up Livid and the Still Standing upgrade ASAP. 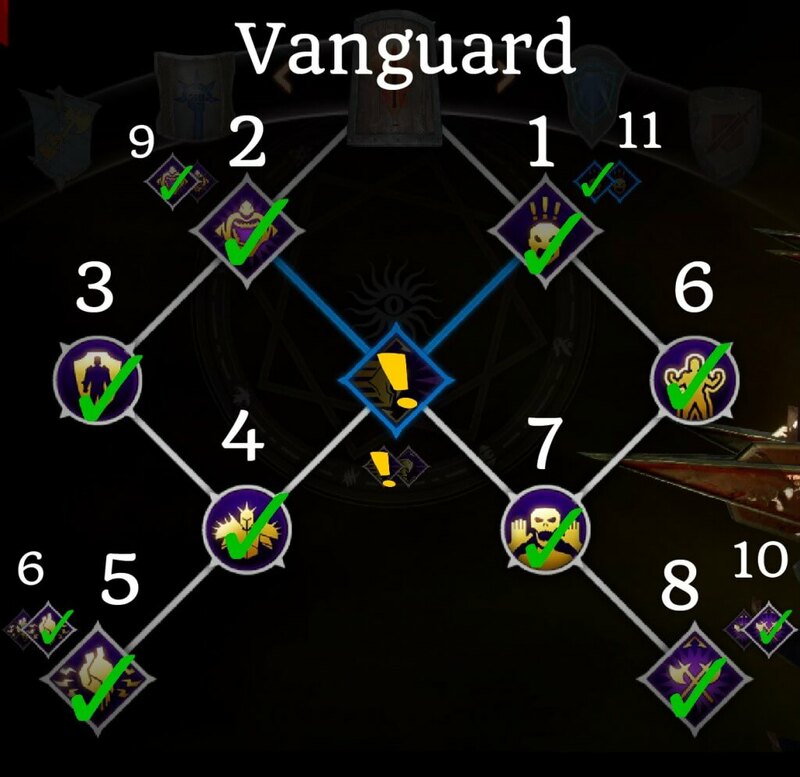 Very late game, you can also try adding Livid (Vanguard skill) to your arsenal, as it works very well with this build by providing you with both damage and survivability. Note: The most important requirement for this build is high critical strike chance; the more you crit, the more you reduce your cooldown times, which means the more you can use Walking Fortress. Despite my early thoughts on the Templar spec, it works far better with a two-handed weapon than with a shield and one-hander. With decent gear you can do some serious damage; not to mention Templars give the party 25% bonus damage, 10% damage resistance, a further 50% damage boost anytime your Templar is unconscious, and a team-oriented Focus skill (Rally). The build is very simple, and also very fun to play thanks to your self-combo (Wrath of Heaven + Spell Purge). The build relies on the two-handed tree to provide you with DPS passives/skills, while the Templar tree gives you a high damage combo and your amazing buff/debuff skills. For your 8th skill, grab either Rally or Mark of the Rift. 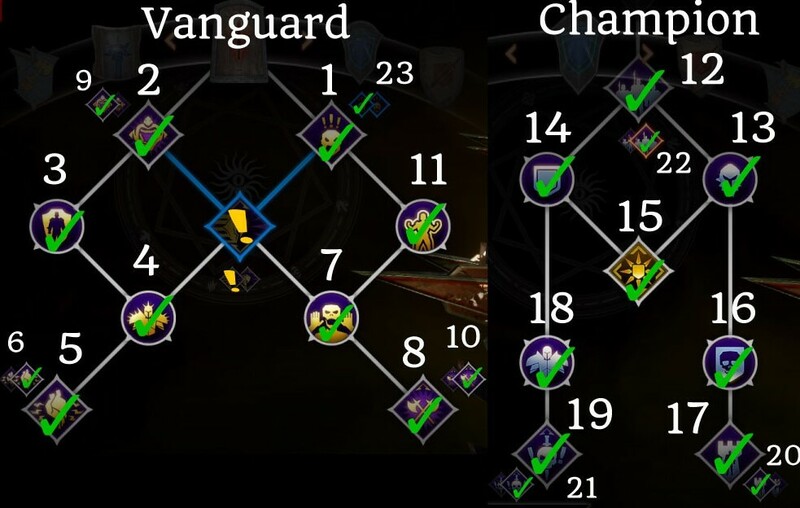 After you finish the core build, you can complete the Templar tree by taking the two skill upgrades, especially Annulment (Spell Purge upgrade) if you have Trespasser. You can also go down into the Vanguard tree to pick up Livid to give you more damage and survivability. With as many enemies near you, use Wrath of Heaven, and then immediately use Spell Purge for a damage combo – in my experience this is the HIGHEST damage combo in the game, and the best part is, you can cast it by yourself!